Here is a simple USB powered lamp that can be used to light your desktop during power failures. The circuit operates from the 5 Volt available from the USB port. The 5V from the USB port is passed through current limiting resistor R2 and transistor Q1. The base of transistor Q1 is grounded via R1 which provides a constant bias voltage for Q1 together with D2. The diode D1 prevents the reverse flow of current from battery. C1 is used as a noise filter. Two white LED’s are used here for the lamp, you can also use a 2 V torch bulb instead of LED’s. LED D3Â indicates connection with USB port. USB port is only able to provide up to 100 mA current. So don’t overload the circuit with more no of LED’s. Before wiring the circuit confirm the positive and ground leads of USB by a multimeter. Switch S1 can be used to turn on the lamp. Hi Deep connect pin 1 of usb to 47 ohms 1/4 watt resistance connect to anode of 2nos white LEDs and their cathode to Pin 4 of USB pin. LOLzzzz, if you still need to connect a external battery why to put it in USB than. Make a LED torch light instead.. I have made the above usb lamp. The lights cannot be turned on when I use 2.4V rechargable battery, however, it is on when I use 3.6 recharable battery. Besides, when I plug the usb lamp into computer’s usb port, it doesnt work..why is it like that? Hi Kailash add one more 1N4007 in series with D2 then the constant current output at Q1 collector will be 30mA . Two Nicad cells fully charged voltage will be 2.64 volt. Connecting the LEDs in series the requirement will be 5.2 volts, which 2 cells cannot supply hence they will not glow. Connect both the LEDs in parallel, then it will work as each requires minimum 2.6 volt to glow. Rechargeable battery is the back up for the LEDs during power failure. The above circuit is not meant for supplying USB voltage to computer during power failure. how many diodes and rechargeable batteries in this diagram are required purpose ? Where we hav to connect d usb? 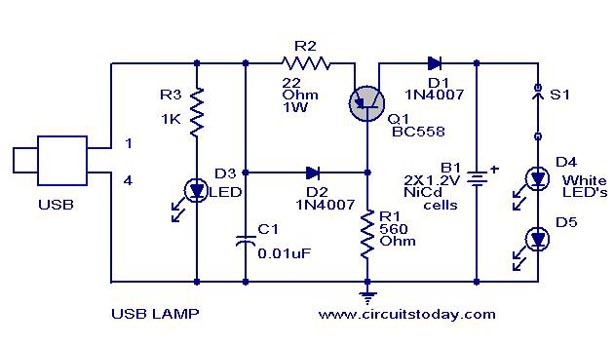 How desktop can b operated with 5volt battery used in dis circuit? Plz send me some reply. Please tell me, why we use battery b1 in USb lamp circuit….? hello. why is there the battery? back-up energy supply when computer is down?